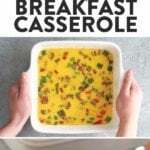 Got a casserole dish? 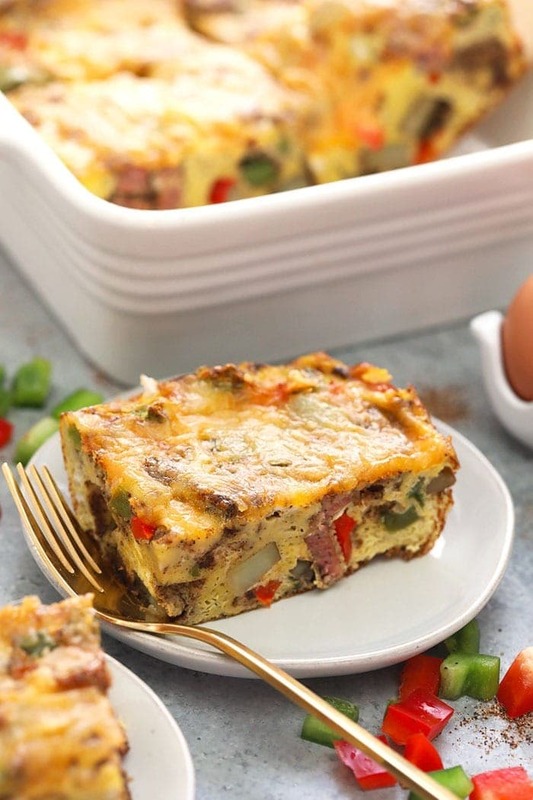 Throw together this easy and savory Chicken Fajita Breakfast Casserole made with chicken breakfast sausage, sautéed veggies and eggs for a low-carb breakfast that will feed a crowd! 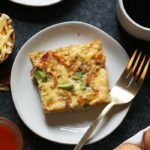 This chicken fajita breakfast casserole is basically the best of both worlds. 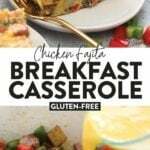 The fajita flavors and veggies you know and love surrounded by eggs in breakfast casserole form! 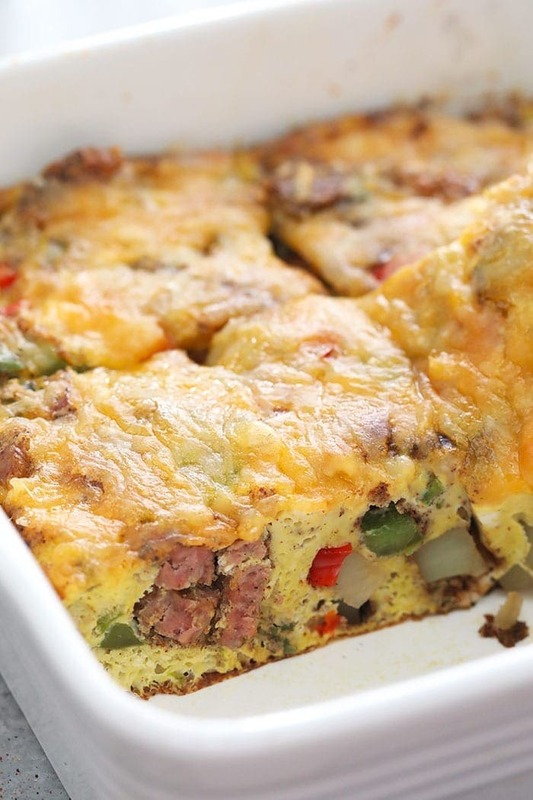 Protein-packed, super flavorful, and great for serving a crowd or meal prepping for the week. Let’s get into it. 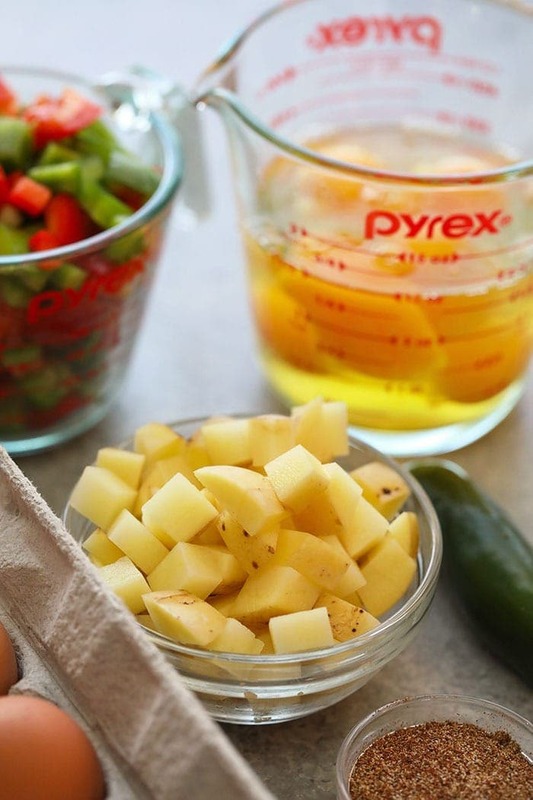 And get the step-by-step instructions for making this homemade fajita seasoning HERE. First, preheat oven to 400ºF and spray an 8-inch by 8-inch baking dish with nonstick cooking spray. 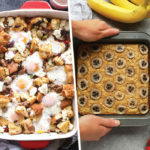 THIS is our go-to square baking dish in the Fit Foodie Kitchen. Then, dice your potatoes (we used Idaho potatoes for this recipe, but feel free to sub for any potato you have on hand!) and mince jalapeños. 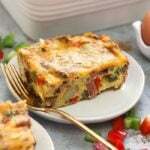 Place in baking dish and drizzle with olive oil. Lightly season with 1/2 teaspoon fajita seasoning, and bake at 400ºF for 10 minutes. While the potatoes are baking, whisk together 10 eggs and 1/4 cup of almond milk (feel free to sub for your preferred un-flavored milk). Set aside. Then, prepare your peppers and onions by dicing finely. Once your potatoes and jalapeños have roasted for 10 minutes, remove from the oven and turn down to 350ºF. Add the rest of the veggies to the baking dish and season with the rest of your fajita seasoning. Toss to evenly coat everything in your fajita seasoning. 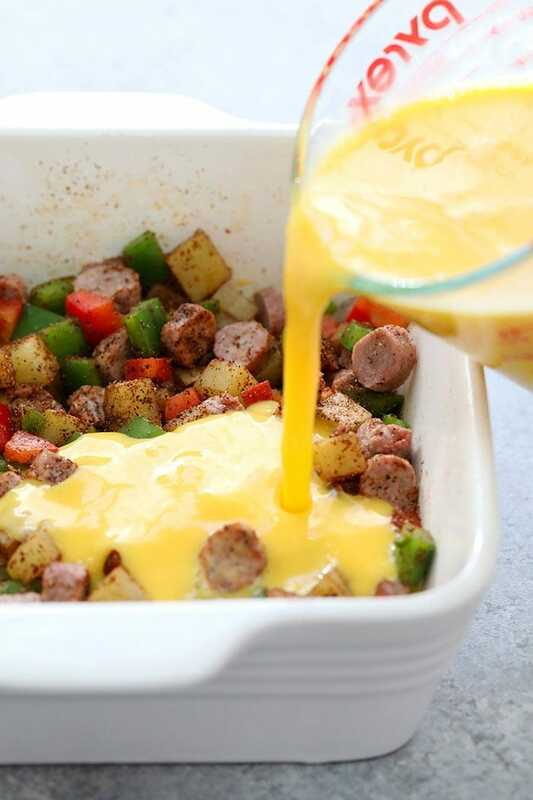 Pour the egg and milk mixture on top of your veggies and mix until combined. Place in the oven and bake at 350ºF for 40 minutes. Then, add cheese and bake for another 5 minutes. Still looking for that perfect egg recipe? 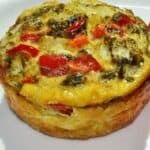 Check out all our recipes with eggs HERE. First, preheat oven to 400ºF and spray an 8-inch by 8-inch baking dish with nonstick cooking spray. Then dice potatoes and mince jalapeños. Place in baking dish and drizzle with olive oil. Lightly season with 1/2 teaspoon fajita seasoning. Bake at 400ºF for 10 minutes. While the potatoes are baking, whisk together 10 eggs and 1/4 cup of almond milk. Set aside. Then, prepare peppers and onions by finely dicing. Once the potatoes have roasted, remove from oven and turn down to 350ºF. Add the rest of the veggies to the baking dish and season with the rest of your fajita seasoning. Toss to evenly coat everything. 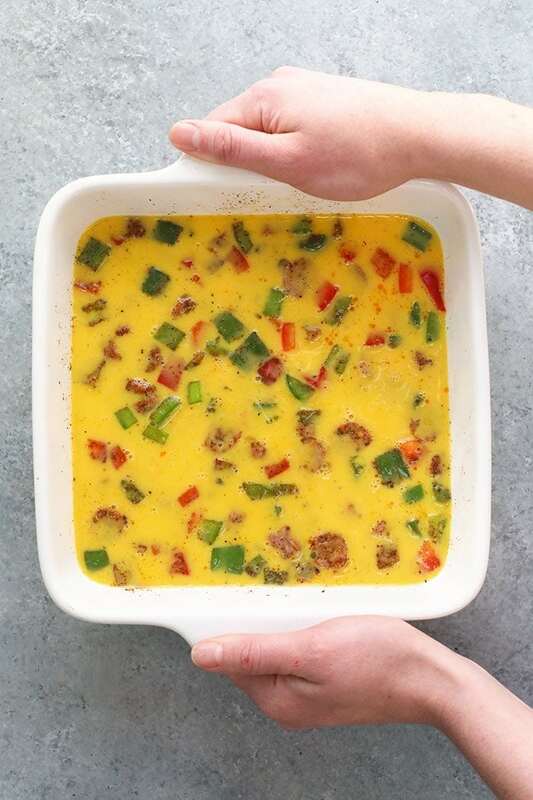 Pour the egg mixture on top of veggies and mix until combined. Remove and let cool for at least 10 minutes before slicing and serving. Storage: will stay in the refrigerator for up to 4 days.